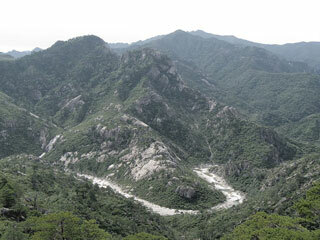 Mount Kumgang has been known for its scenic beauty since ancient times and is the subject of many different works of art. Including its spring name, Kumgang. It has many different names for each season, but it is most widely known today in the Korean language as Kumgangsan. In summer it is called Pongraesan (the place where a Spirit dwells); in autumn, Phung'aksan (hill of colored leaves, or great mountain of colored leaves); in winter, Kaegolsan (stone bone mountain). This article uses material from the Wikipedia article "Mount Kumgang", which is released under the Creative Commons Attribution-Share-Alike 3.0 License.